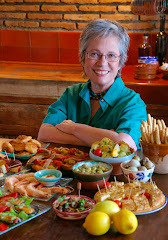 I was working on an article about Spanish food for a British magazine, with recipes for some of my favorite tapas. 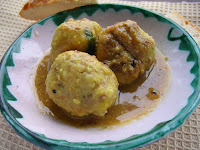 One I chose is a tapa bar classic—meatballs in a saffron-almond sauce. The editor asked if I had any photos, and I realized that I hadn’t made meatballs in a really long time and had no photos in my files. Now I do. They were so delicious. This recipe reminds me of what I love about ordinary Spanish food—the subtle spicing, use of ground almonds and wine in a sauce. And the immediacy—I am gathering almonds from the trees on the edge of my property. Most Spanish words that start with “al,” as in albóndigas and almendras, derive from the Arabic. The flavorings for these meatballs and sauce could be straight out of a 12th century Moorish cookbook. 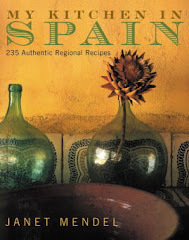 Many spices, such as the saffron, cloves and nutmeg in this recipe, as well as almonds were introduced into Spanish cooking by the Moors, Arabs who invaded Spain in 711 and ruled parts of the country for nearly eight centuries. Make these meatballs with all pork, a combination of pork and beef, or ground chicken thighs. 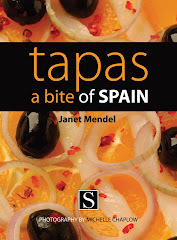 As a tapa, serve them with chunks of bread. Or turn meatballs into a main dish with rice or noodles alongside. Makes 40 to 50 meatballs. 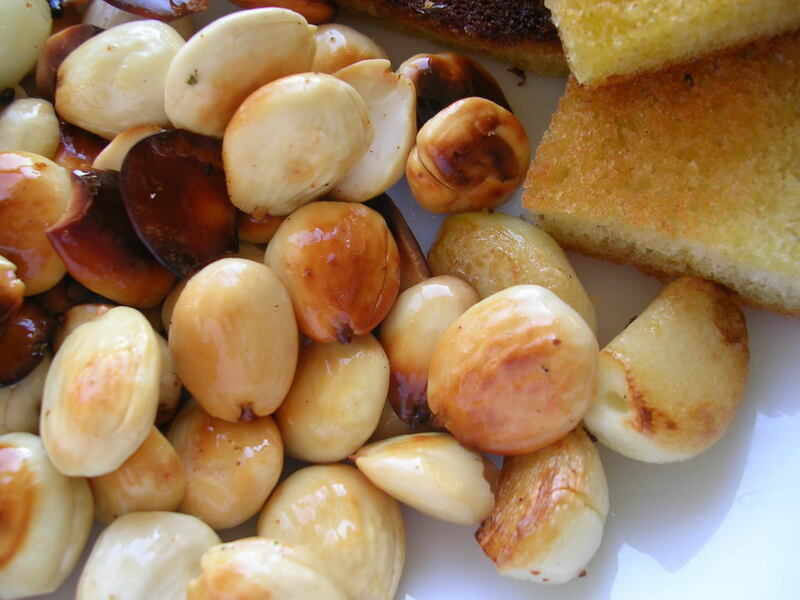 Fried almonds, garlic and bread. Combine the ground beef and pork in a bowl. Soak the bread in water or milk to cover until soft. Squeeze it out and add to the meat with the garlic, onion, parsley, salt, nutmeg and egg. Knead well to make a smooth mixture. Form into 1-inch balls. Roll them in flour and fry slowly in hot oil until browned on all sides. Remove and drain. Heat 3 tablespoons of oil in a skillet and fry the almonds, bread and garlic in the oil until golden. Remove. 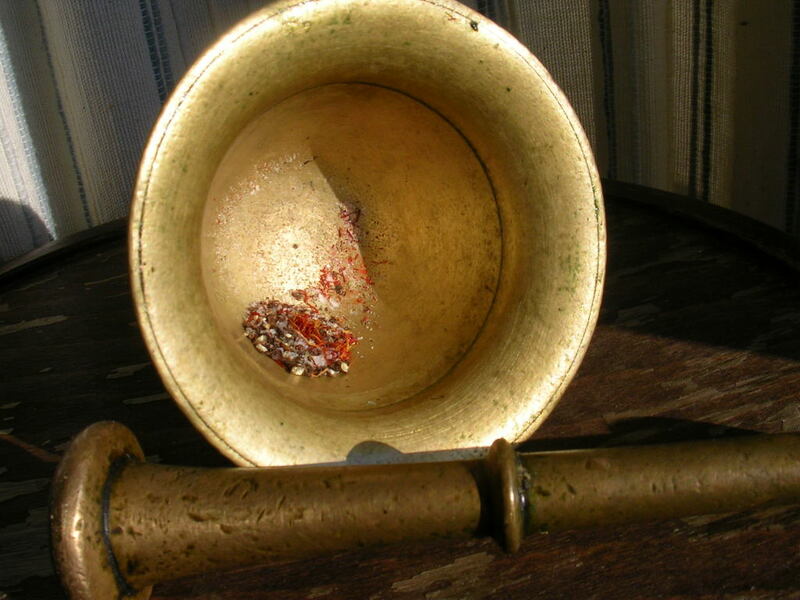 In a mortar, crush the peppercorns, saffron, clove and salt. 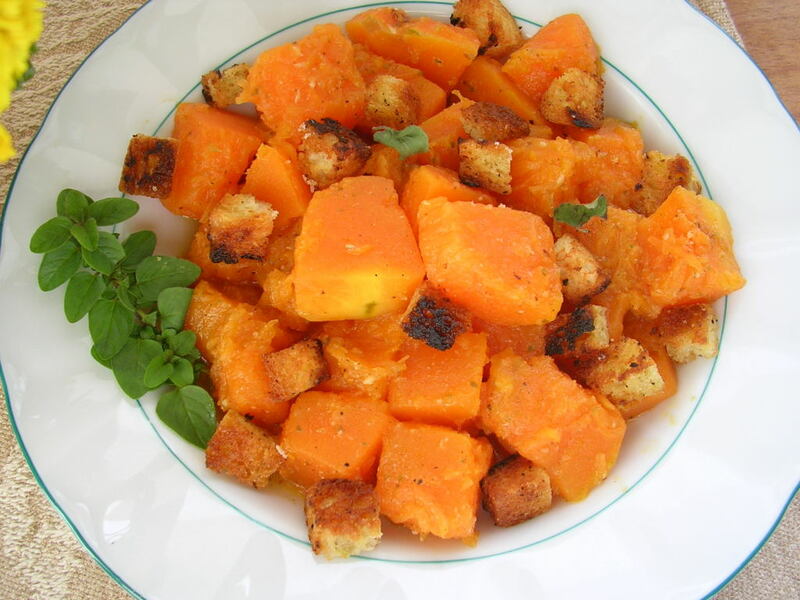 In a food processor, grind together the toasted almonds, bread and garlic with the wine to make a smooth paste. Add the spices to this mixture. Stir the almond mixture into the oil in the skillet and add the stock. Bring to a boil, then add the fried meatballs. Simmer the meatballs, stirring occasionally, for 15 minutes. Add additional liquid as needed. Serve the meatballs garnished with chopped parsley. 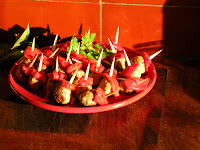 Here’s another meatball recipe, a versatile party dish. 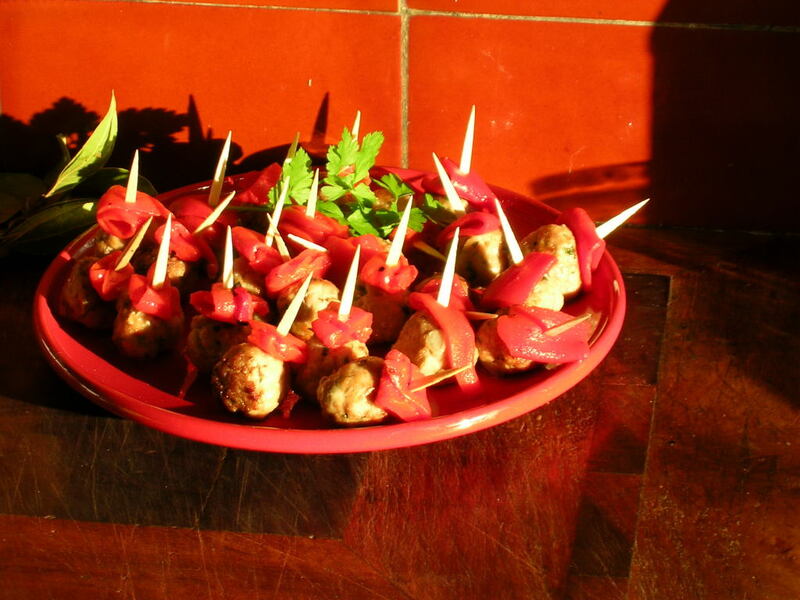 The meatballs are accented with piquant piquillo peppers and require no sauce. If you can’t find piquillos, use any roasted pimiento. These meatballs are quickly fried. A light flouring prevents the meatballs from splattering when frying. However, if you are preparing them for a crowd, try baking them, unfloured, in a hot oven (450º for about 12 minutes). Place the pork in a bowl. Add the garlic, onion, and parsley. In a small bowl combine the salt, cayenne, pimentón de la Vera, sweet pimentón, cumin, thyme, oregano, pepper, and nutmeg. Add the vinegar and stir to make a smooth paste. Dribble the spice mixture into the meat. Knead the meat with the hands to distribute the seasonings evenly. Allow the meat to stand at room temperature for 1 hour or, covered and refrigerated, for up to 24 hours. Form the mixture into 1-inch balls. Dredge the meatballs in flour, patting off excess. Heat oil to cover the bottom of a large, heavy skillet. Fry the meatballs in two or three batches, turning to brown them on all sides, until browned and cooked through, about 5 minutes. Remove meatballs to drain on paper towels. Cut each piquillo pepper into 6 strips. Fold a strip into thirds, spear it with a toothpick, and skewer a meatball. Place on a serving platter. Serve meatballs hot or room temperature. 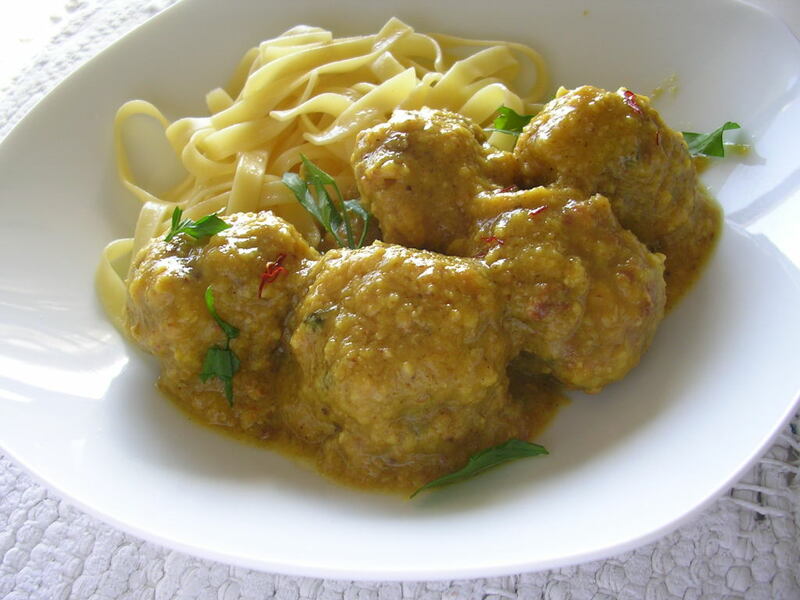 If desired, meatballs can be prepared in advance and reheated in the oven. 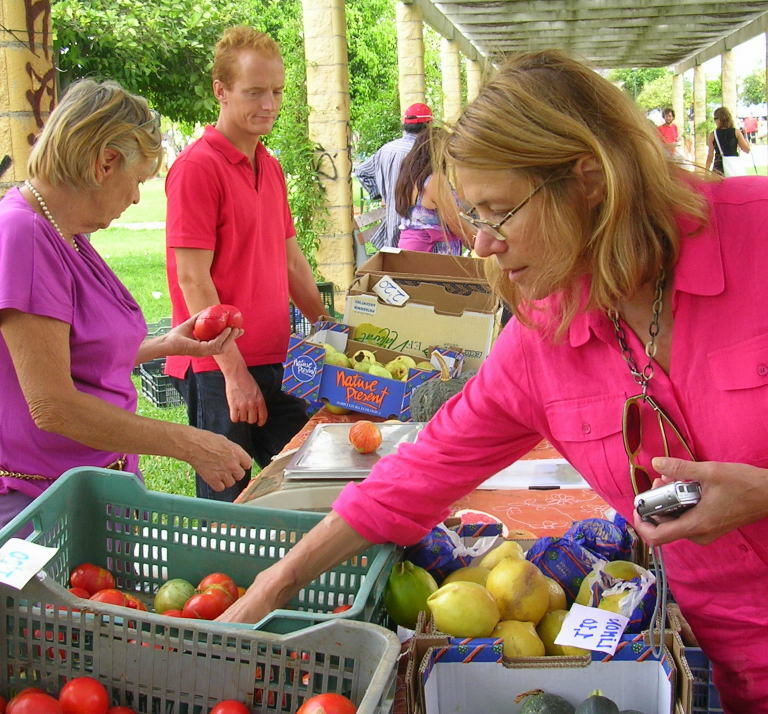 Donna Gelb picking out the perfect tomatoes. As we strolled through the market, filling baskets with fresh produce—gorgeous heirloom tomatoes, striped eggplant, fat zucchinis, glowing red peppers—I started planning my dinner menu. 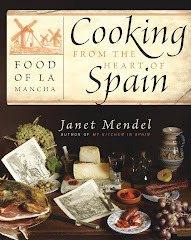 “When Spain entered the Common Market, I started a citrus cooperative here. That's where I learned the commerce of fruits and vegetables. I was the link between the market and farmers. I represented the Spanish Citrus Corporation on various commissions in Brussels. “Once I got started in farming, I was horrified at what local farmers were using—loads of pesticides and chemical fertilizers. I come from northern Europe, where already there was a different vision about the environment, about working with nature. I feel connected with the earth. For me, ecological farming is a life-style. When Elly got her certification as an organic grower, there were fewer than 200 in all of Spain. Now there are thousands. 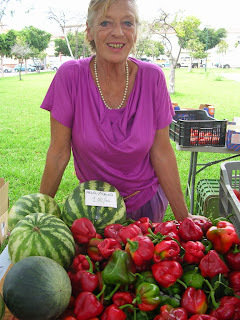 Elly’s farm and organic produce business, Nature Present, is still going strong, only now her grown children run it. Back when I first visited Elly’s farm, I made an interesting observation. Standing in a field of organically grown, ripe tomatoes, I picked one and took a bite out of it. Yes, it was better than the tomatoes in the supermarket—but not a lot better. Her business consisted of shipping organic tomatoes to Britain and Germany, so she was growing the same commercial variety as the non-organic growers. Bred for resistance, not flavor. Her tomatoes today were a revelation—heirloom varieties, packed with flavor. We selected a dozen of those beauties. 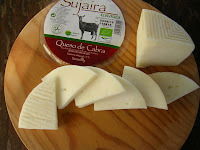 Besides fruits and vegetables—the first quinces, cherimoyas, almonds and olives were on sale at the market—we found organic goat cheeses, olive oil (from last year’s pressing), eggs, fresh bread and packaged cereals and herbal teas. My menu was shaping up. A plate of sliced tomatoes. That goat cheese, sliced and fried, with a quince sauce, then chicken braised with all those vegetables we had bought. As there was no meat at the organic market, I needed to make a stop at my local butcher who sells free-range poultry. Chicken braised with eggplant, zucchini and peppers, a Catalan dish. 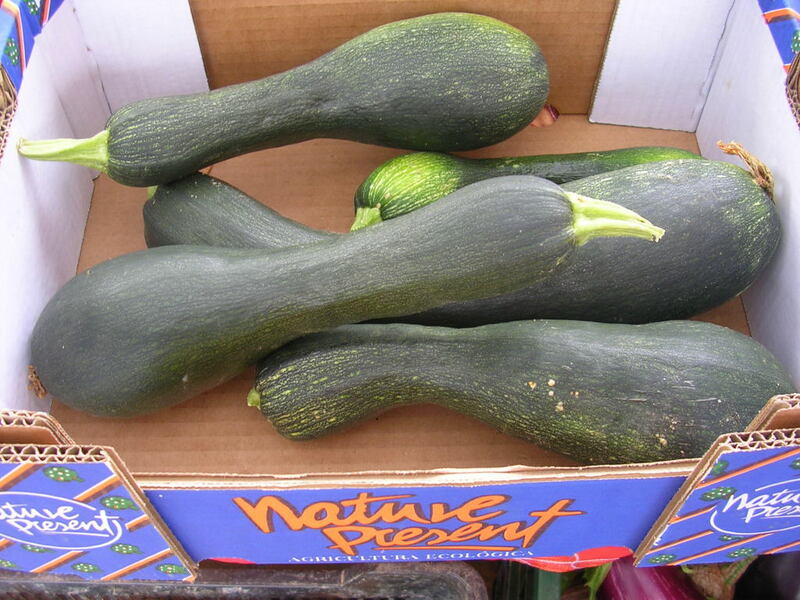 Samfaina is a Catalan “sauce” of eggplant, peppers and zucchini. 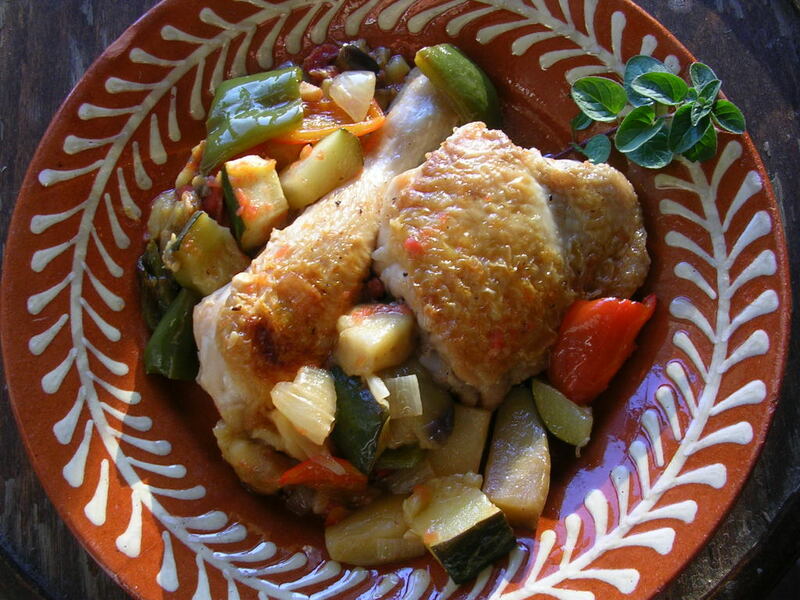 Serve the chicken and vegetables accompanied by fried bread, rice or noodles. The Catalans have an interesting technique for preparing tomatoes: grated instead of chopped. 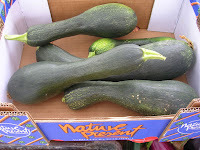 Slice off the tops and stems of the tomatoes and grate them on a box grater, saving all the juice and pulp. The skin acts as a shield so you don’t grate your knuckles. Sprinkle the chicken pieces with salt and pepper. 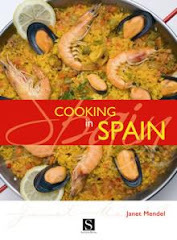 In a cazuela or large skillet heat half of the oil. Put in the chicken pieces and brown them very slowly. Remove the chicken when browned. Add the remaining oil to the cazuela and sauté the bacon, eggplant, peppers, zucchini, onions and garlic for 5 minutes. Add the tomatoes, Sherry, salt and pepper, bay leaf, oregano and parsley. Return the chicken to the cazuela. Cover and cook slowly until the chicken is tender, about 50 minutes. The vegetables should release enough liquid to keep the chicken from sticking. If necessary, add a little water to the cazuela. Use semi-cured Spanish goat cheese, which is tangy and salty. 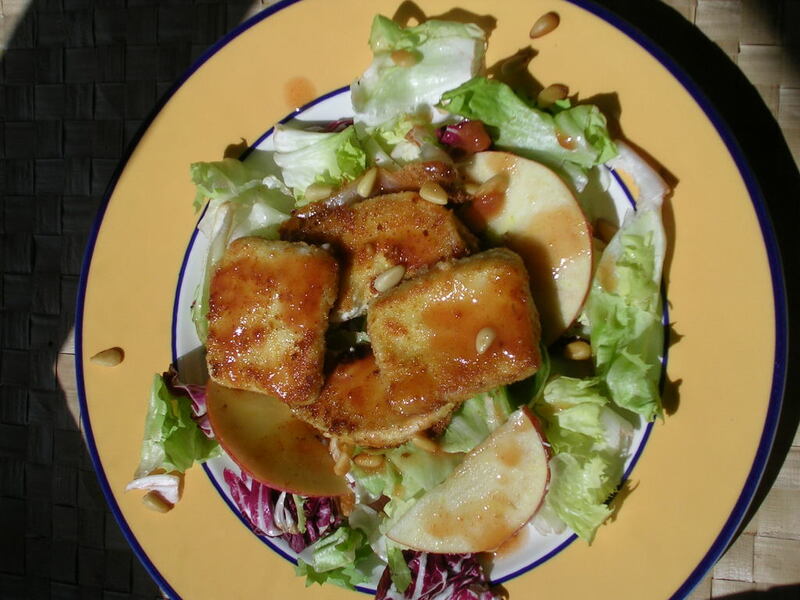 This makes a lovely starter served atop salad leaves with toasted pine nuts and a sweet-sour quince sauce. 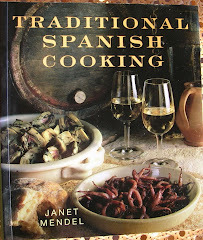 Makes 10 tapas or starters. Slice the cheese 3/8 inch thick. Depending on shape of the slices, divide them to make 10 slices that are more or less the same size. Put the flour and egg in two shallow bowls. Place the bread crumbs in a shallow tin and add the cumin seed. Dredge the cheese slices in flour and pat off excess. Dip them in beaten egg, then coat in breadcrumbs. Place 1 teaspoon of the oil in a small frying pan and toast the pine nuts until they are golden. Remove. Place remaining oil in a large frying pan and place over medium heat. Fry the cheese slices until golden brown, about 1 minute per side. Drain on paper towels. Place greens on salad plates. Top each serving with a slice of fried cheese. Garnish with sliced apple and a scattering of pine nuts. 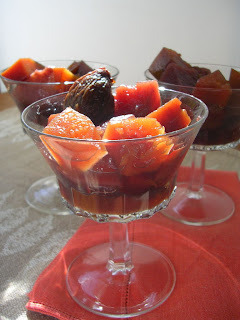 Drizzle the quince sauce over the cheese. Serve immediately, while cheese is still warm. Quince is an autumn fruit so rich in pectin that, when cooked with sugar, it sets up into a solid paste that can be cut into cubes (dulce de membrillo). A handy ingredient to keep in the pantry, quince paste can be turned into a quick sauce, delicious served with pork, with cheese croquettes, with foie gras, with duck. The sauce thickens as it cools. Serve it room temperature or reheat it in a small pan. 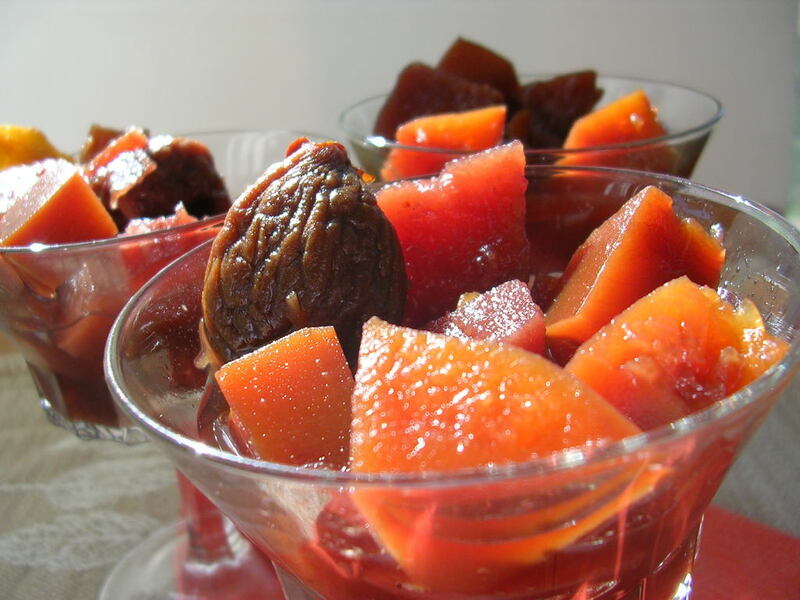 Cut the quince paste into pieces and place in a blender with the vinegar and boiling water. Blend until quince is smooth. 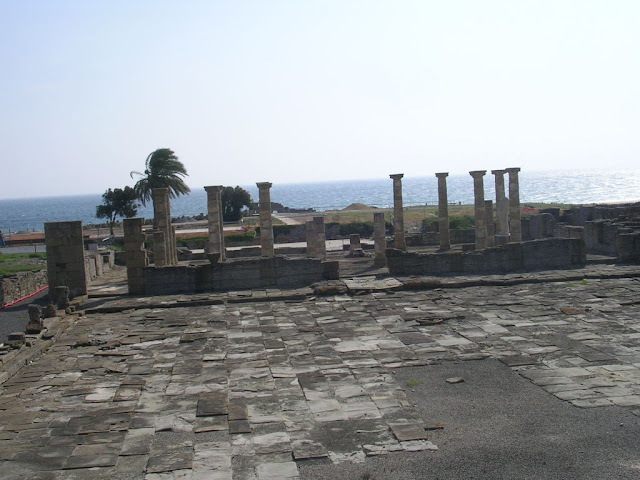 Roman ruins of Baelo Claudia. 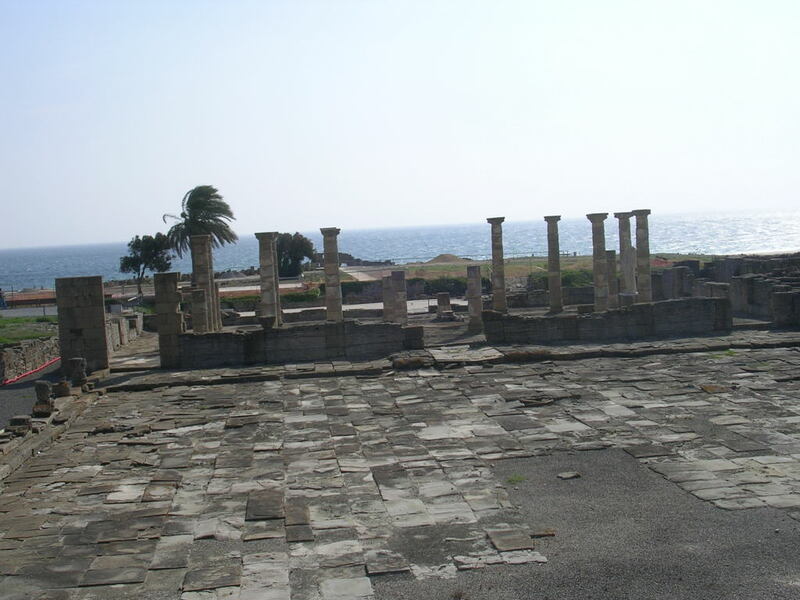 While my friend Donna from New York was visiting last week, we made an excursion to see the Roman ruins of Baelo Claudia. 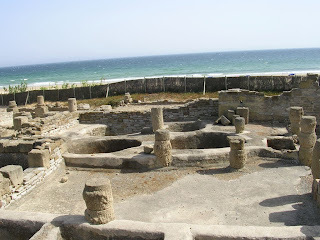 Situated right on the wind-swept beach of Bolonia, near Tarifa in the Straits of Gibraltar—the southernmost tip of Europe—the ruins are of a fairly substantial town that thrived from the 2nd century BC until 2nd century AD. Vats where garum was produced. Temples, market, forum, amphitheater make up excavated ruins. 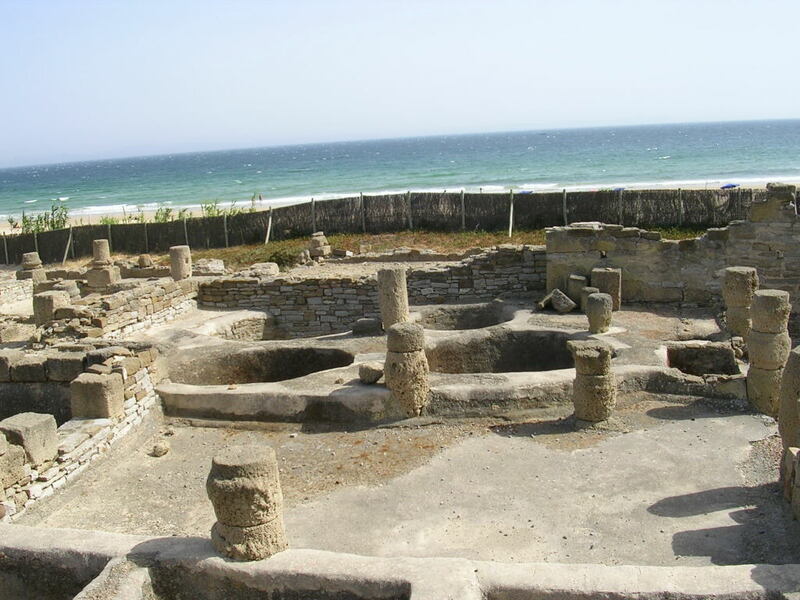 And, beside the sea, are pits where garum, the salsa of the ancients, was produced. Garum, made of tuna guts fermented, brined and seasoned, was the earliest manufactured food produced in Spain and shipped back to Rome. 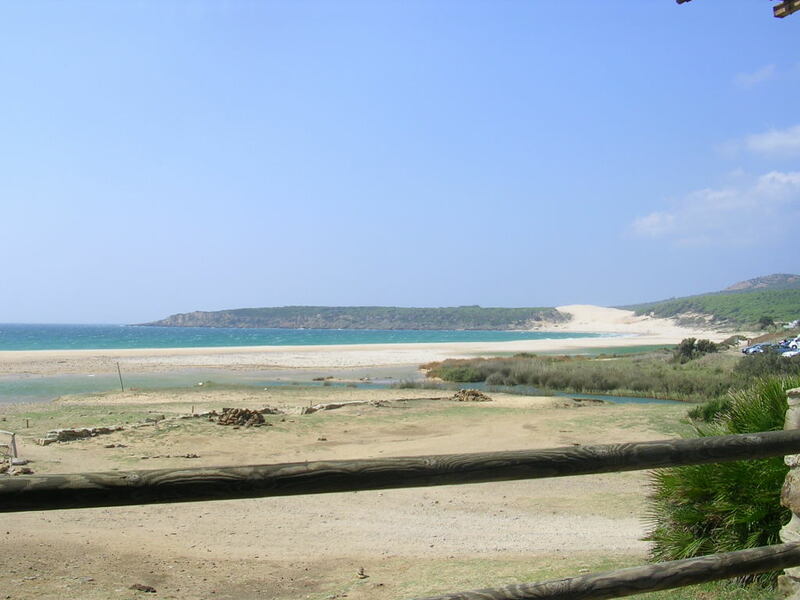 If in Roman times this was a thriving commercial port, nowadays it is a quiet beach where cattle mosey almost to the water’s edge and kite surfers crisscross the sky. North Africa looms in the haze over the sea (this is the Atlantic). 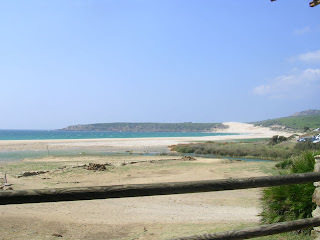 Beach and dunes at Bolonia. I love landscapes, seascapes and Roman ruins, but what I really like about excursions is lunch. Just beyond the archeological enclosure are several chringuitos, beach-shack restaurants. Ensconced on a terrace out of the wind, we ordered a lunch of fresh seafood. 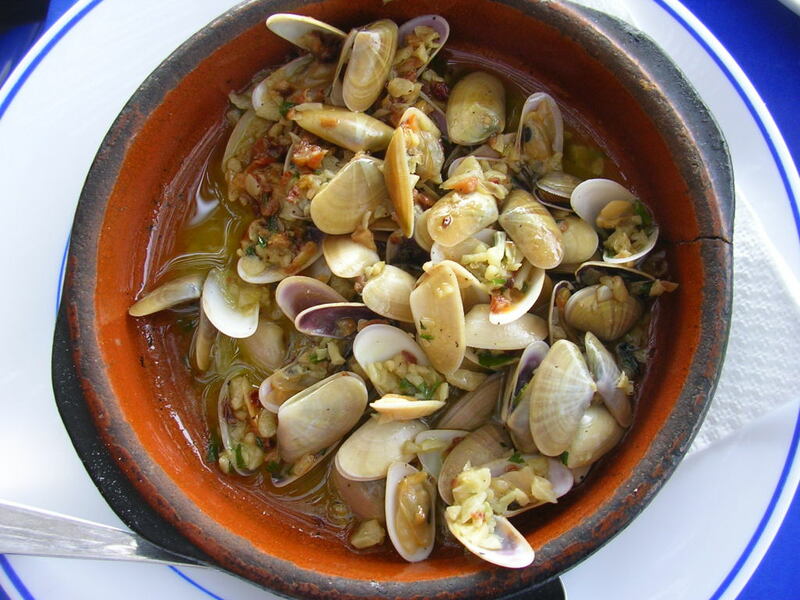 Coquinas, small wedge-shelled clams, cooked with garlic and wine, para picar, to share while our fish cooked, then a whole grilled fish for each of us. 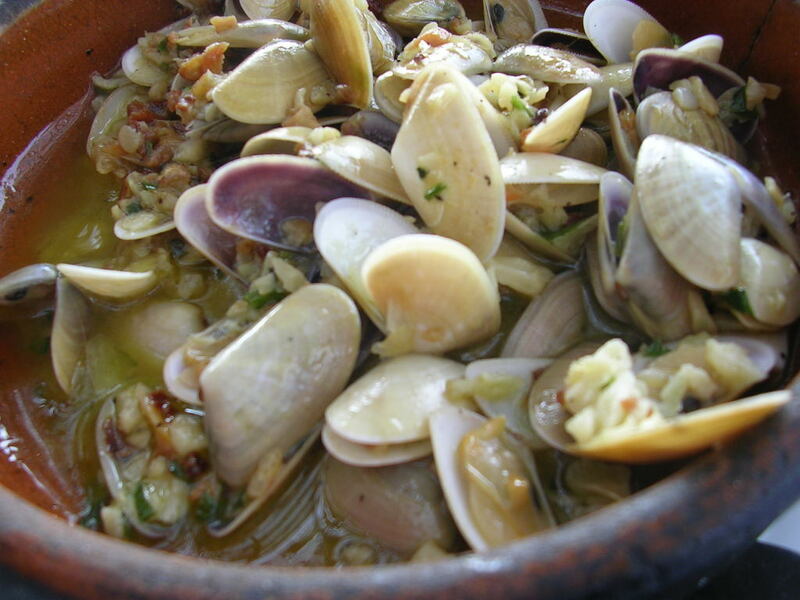 Coquinas are tiny wedge-shell clams. 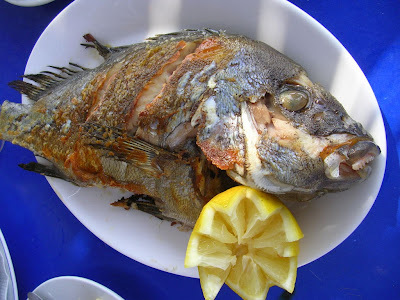 We chose borriquete, identified in Alan Davidson’s book, The Tio Pepe Guide to the Seafood of Spain and Portugal (Santana Books, 2002) as “rubber-lip grunt,” a type of bream, because it looked marvelously fresh. The waiter told us it is fished right off this coast, whereas the sea bass come from a piscifactoria, or fish farm. The fish (priced by weight—and these were big ones!) were simply grilled on a plancha, a flat griddle. No sauce was served with it (some garum, perhaps? ), but roasted red peppers and patatas fritas came alongside. We devoured every morsel. 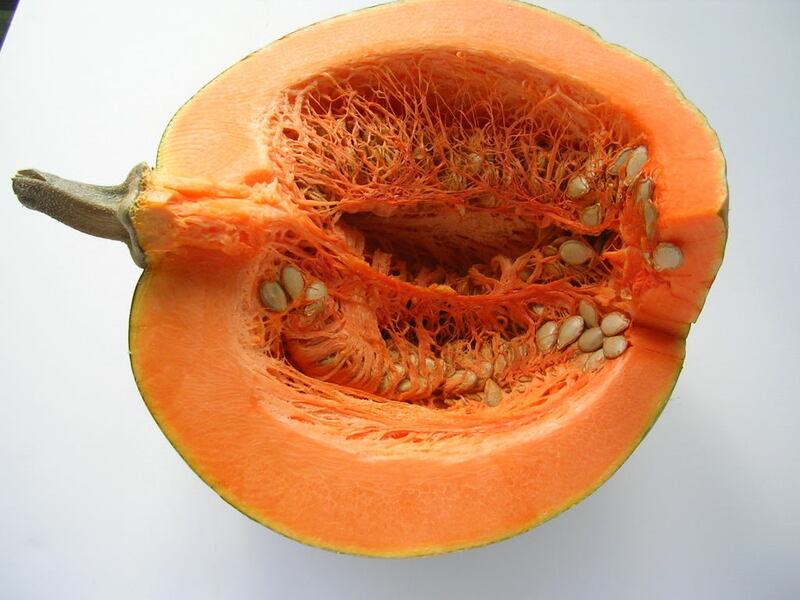 The flesh was sweet and moist, the skin crackly. Borriquete--a type of bream--grilled to perfection. 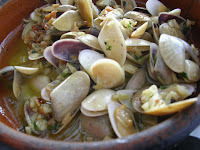 In Andalusia, tiny clams such as the wedge-shells in the photo are prepared this way, with garlic, parsley and wine. But you can use slightly larger Manila clams too. This is usually served as a plate for sharing. 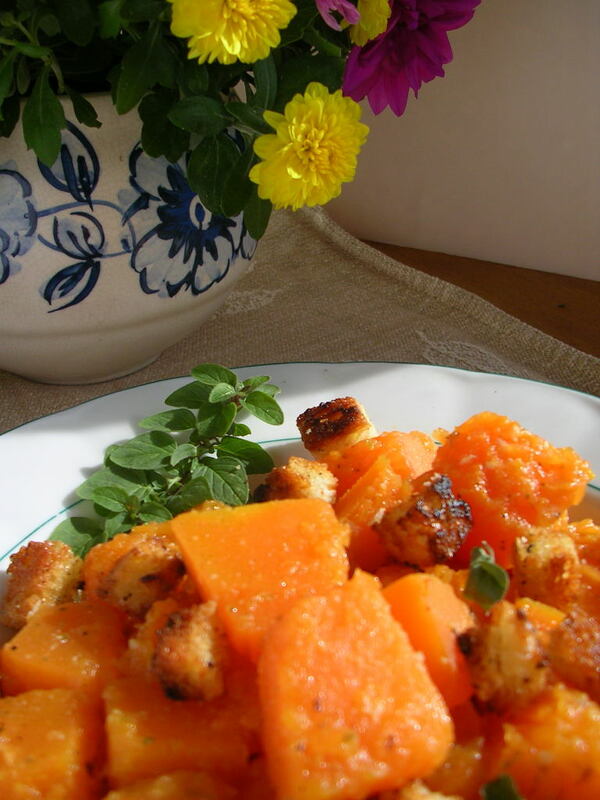 Place the pan in the middle of the table and accompany with chunks of bread for sopping up the sauce. Serves 3 to 4 as a shared starter. Wash the clams in running water. Discard any shells which are opened or cracked. In a cazuela or deep skillet heat the oil and sauté the garlic 1 minute. Stir in the flour, then add the clams. On a high heat, add the wine, water and chili. Cover and shake the pan until the clam shells open. This takes 3 to 4 minutes. Remove from heat when most of the shells have opened. Top with chopped parsley. Serve immediately with bread. 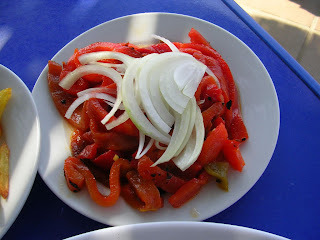 Roasted peppers served with grilled fish.